As a last-ditch effort to resurrect its economy, the Venezuelan government has created a national cryptocurrency called the petro in hopes of remedying its hyperinflation and subverting sanctions. Though a national cryptocurrency has the potential to represent a big step for blockchain technology, the petro token is shrouded in a thick layer of disinformation, leaving many to wonder if the token actually exists. And while this huge amount of disinformation has led to significant confusion for potential investors and Venezuelan officials alike, the real victims of this get-rich-quick scheme are the Venezuelan people themselves — people who are already facing a severe humanitarian crisis. Although there are many problematic aspects to the burgeoning petro cryptocurrency, the token’s centralized, untraceable, and unobtainable qualities are the most distressing. Using the initial coin offering model, the petro token, which is pegged to the country’s massive oil reserves, went on presale this past February. Its public sale supposedly opened on Oct. 29, deviating from its original date of November 5. With this new release date came a new website and white paper to boot, which is confusing considering the Venezuelan government had a completely different website and white paper for its presale in February. The petro’s most recent white paper refers to it as “the first digital currency promoted and issued by a State.” Similarly, the original white paper released in February calls it “a sovereign crypto asset” issued solely by the Venezuelan government. This notion of a sovereign cryptocurrency that is issued and controlled by Venezuela defies the very value of decentralized control that blockchain technology stands for. Most cryptocurrencies operate on public blockchains, decentralized public ledgers that cannot be censored by any one entity. In the case of the petro, however, it is unclear which blockchain it operates on as the original white paper references operation on both the NEM blockchain and the Ethereum blockchain (both of which are public) as well as on its own government-controlled blockchain. Similarly, the newest petro website promotes a petro block explorer, which is supposed to allow you to view transactions of the petro purchases. However, this new block explorer still does not clarify which blockchain it uses and does not account for petro transactions prior to October 13, 2018, leaving a huge gap from its presale in February 2018. Essentially, the petro is not run on a transparent public blockchain like the currencies ethereum and bitcoin. This means there is no complete, immutable record of transactions that Venezuelans and others could go to verify price and ownership information. This lack of transparency in regard to the petro’s blockchain makes it nearly impossible to verify exactly how many petro tokens have been sold and for what price. Maduro confounded the crypto community with claims that the token raised roughly $735 million on the first day of its presale and $5 billion by the end of the presale. If these numbers are true, it would make the petro one of the most successful ICOs in history. However, no major crypto exchanges list the petro as an exchangeable currency nor have any experts been able to definitively track the flow of billions of dollars worth of exchanges of this token, according to Dr. Tom Robinson, co-founder of blockchain forensics firm Elliptic. I investigated the process it would take to purchase the petro now through its “Petro App” — a new addition to the national cryptocurrency since its second launch and the main channel through which the website allegedly sells the petro. In my attempts, I was not only unable to access the landing page to purchase petros, but also I was unable to click on the widely discussed transfer and savings capabilities of the app. The kicker to all of this is that if anyone would be able to know how to purchase a cryptocurrency, it would be a Venezuelan. As the country’s economic crisis has worsened, more and more citizens have turned to digital currencies to preserve what little value their bolivars had left. Though mining bitcoin and ethereum takes a significant amount of electricity, it still became a popular source of income for many as electricity use in Venezuela is incredibly cheap. So, no one can verify most of the petro transactions to date and a country filled with crypto-savvy citizens is unable to purchase its new national cryptocurrency. This begs the question: does the petro even exist? Some speculate that the enormous statistics Maduro claims could be the result of significant foreign investment or straight up fabrication from the government. And, even if it does exist, the lack of transparency over how the petro operates demonstrates the complete control the government plans to enact over the cryptocurrency. Only time will tell if this public sale of the petro will allow actual individuals and Venezuelan citizens to purchase the petro. With the government’s monopolized control over the petro comes the continued disenfranchisement of Venezuelan people and their rights through the funding of human rights abuses and active disregard for the plight of its citizens. In “Authoritarian ICO: How Venezuela’s Government Is Abusing the Blockchain,” Robert Greenfield documents the repeated human rights abuses of the Venezuelan government and argues that the investment and use of the petro will inevitably lead to such abuses. 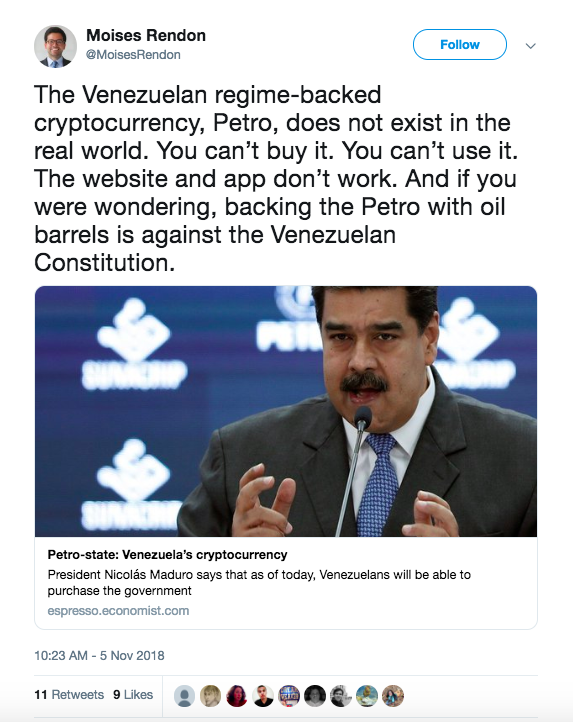 Greenfield sees the petro as a blatant attempt by the Maduro regime to eliminate resistance and maintain their power by completely controlling the use and distribution of a government-sponsored cryptocurrency under the guise of economic stimulus. 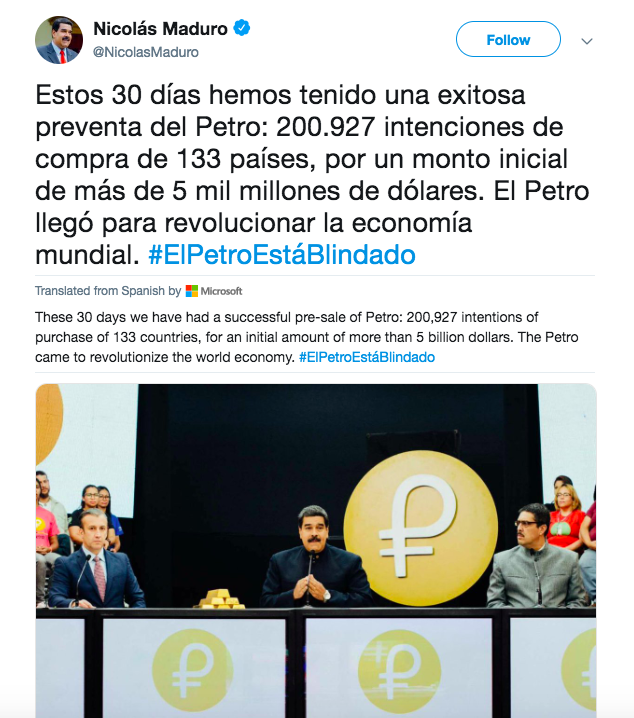 The petro is not focused on saving Venezuela and its citizens but instead is an attempt to maintain the authoritarian government Chavez created. 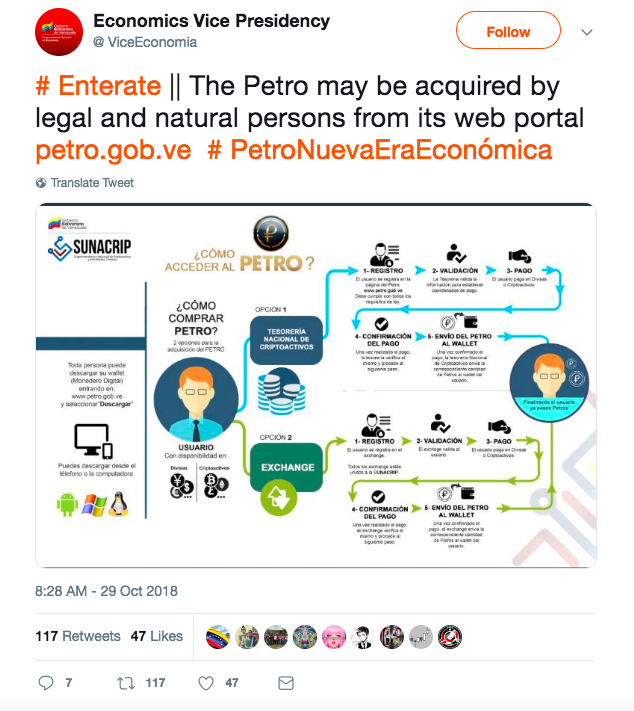 One needs to only read either of the government-issued white papers to realize this: The documents rarely, if at all, mention the benefits the petro will offer Venezuelans, but repeatedly emphasize the numerous benefits the petro affords foreign investors. The Maduro regime is spending more time and energy promoting this potentially nonexistent technology instead of addressing the actual problems at hand. Financial crime expert and former CIA analyst Yaya Fanusie argues that the continued development of the petro will not produce the food, water, and medicine that hundreds of thousands of Venezuelans desperately need. He adds that the very same leaders who triggered the country’s humanitarian disaster are the ones controlling the petro’s purse strings. Why should we expect them to change their actions in any way? Until the Venezuelan government starts actually addressing the crises facing its country, instead of scrambling to maintain power via a poorly-executed cryptocurrency, the country’s economic and humanitarian disasters will only worsen. Be on the lookout for more investigations by the Human Rights Center’s Disinformation Team to help combat the disinformation surrounding political discourse and human rights. The Human Rights Investigations Lab is a part of the Human Rights Center, UC Berkeley School of Law. To learn more about HRC or the Lab, click here.